It is often said that Mexico is very similar to the Caribbean islands which is why it is on the must travel list of savvy travelers. Perched on the Yucatán Peninsula, Cancun is one of the most well-known cities in Mexico with thousands of tourists flocking there every year for the white sands, turquoise waters and golden sunshine. If you’re considering visiting Mexico for the first time, Cancun should be your destination of choice. With an exciting range of activities such as scuba diving in Cancun, snorkeling, ziplining, whale watching, and so many tourist attractions, it's next to impossible to get bored in Cancun. A scuba diving charter on board one of our private yachts in Cancun will make your stay all the more memorable. Ask fellow travelers for their recommendations on the best things to do in Cancun – they would say Cancun scuba diving is a not to be missed activity. PUNTA NIZUC – Punta Nizuc is located along the edges of the Great Mayan Barrier Reef, the second largest reef in the world. This destination is famous amongst travelers for its calm and quiet location, the variety of activities you can do there and its natural beauty. The warm, clear and shallow turquoise waters of the Caribbean Sea offer the best way to see the marine life underwater. The natural prolific coral garden is home to a large variety of aquatic species including loggerheads and endangered species of turtles. Divers will have a wonderful experience to get a little closer at these friends of nature. PUNTA CANCUN – Punta Cancun is another popular spot in Cancun where divers head to. The shallow reef is located close to the shore and is good for both beginner and experienced divers. Punta Cancun is home to colorful coral formations and diverse marine life which together make it a spectacular sight to behold. Examples of such marine life include stingrays, barracuda and sharks. This is a good spot for drift diving as constant current runs from the south-east almost year-round. Punta Cancun is a relatively shallow reef which provides the perfect necessities for the coral reef to grow and prosper. CENOTE DIVING – The Yucatán Peninsula is home to a network of underground caves that runs through hundreds of kilometers in limestone rock. Cenotes are sinkholes that provide an entrance into this cave system. These spectacular pools are filled with crystal clear, turquoise water. Some of the caves even feature stalagmites and stalactites making them even more beautiful. Diving in these cenotes is the most popular activity amongst divers from all over the world. Dos Ojos – the popular cenote amongst divers of all levels is a fantastic place to snorkel in these amazing caves. The spectacular cenote diving is a must try!! THE UNDERWATER MUSEUM – The Underwater Museum of Cancun is divided into two sections and consists of more than 470 life-sized sculptures. The Cancun museum is an eco-project designed to give a well-earned break to the natural reef and to provide habitat for fish and other reef creatures. The 500 sculptures filled with coral reefs and allow you to dive and snorkel within a spectacular setting. The visit to Cancun remains incomplete if you haven’t been to MUSA as it provides all its divers with a spectacular treat. The eco-friendly museum under the sea is located between Cancun and Isla Mujeres. ISLA MUJERES – The nearby islands also have many places to go on a scuba diving escapade while vacationing in Cancun. Many Isla Mujeres scuba diving locations are great for beginners due to their shallow depth and great visibility. All beginners looking for scuba diving certification, Isla Mujeres is a great place to start. Another place for scuba diving in Isla Mujeres is the Cave of the Sleeping Sharks which is good for experts to explore. 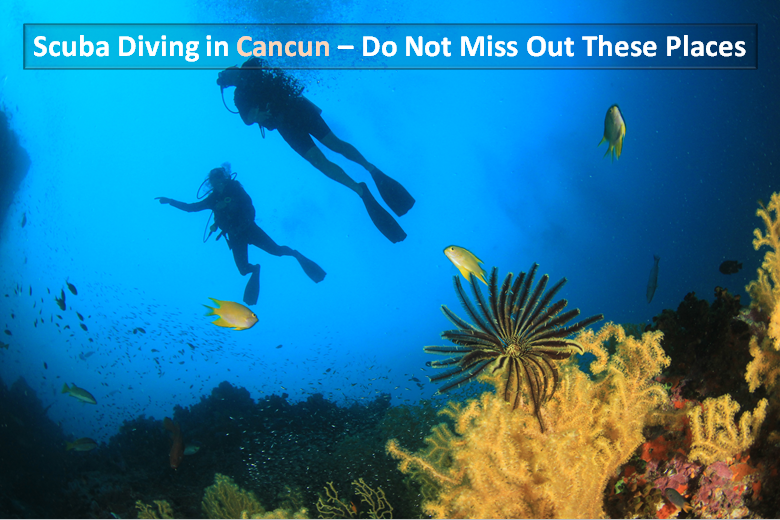 Most Cancun scuba diving tours include the equipment and private transportation on board a boat to the dive site. Your own private yacht charter for scuba diving in Cancun will take you to all these destinations to make your diving escapade in this Mexican region a memorable one.